I’m not feeling all that happy today. 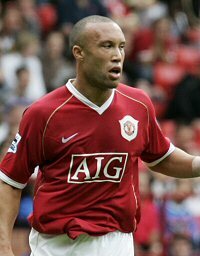 This morning, just about every paper and Arsenal blog held the story that Mikael Silvestre might be joining us in a cut price deal from United, in order to either slot into our defence or provide squad backup. A story that initially seems ludicrous is gathering momentum, and it is unclear whether everyone is repeating the same baseless source, or if there really is something to it. My initial reaction was that this is utterly ridiculous, and if I’m honest, I hope I’m right. There are comparisons to Gallas and Diarra from the past couple of years – Frenchmen that we’ve unexpectedly picked up from major rivals close to the transfer deadline. But the similarities don’t really exist. Gallas might not be a young man, a popular man or indeed a good leader, but he is a winner, someone who leaves everything on the pitch and fights every minute of the match. He is also a cultured goalscoring defender, and those traits allow us to see beyond his Chelsea background and his tantrums and appreciate that he still offers something to this side. Diarra is completely different. He doesn’t have Gallas’ fight, but he is a superb defensive midfielder, and is at an age where he could become a monster of a player in the next two or three years, if nurtured in the right environment. Wenger gave him that chance, but his lack of patience, maturity and sense saw him move on for short term gain. That myopia will cost him in the long run. Silvestre does not have the positive traits of either. He is not as much of a fighter as Gallas, and has not the potential for improvement of Diarra. We all appreciate the ability of Clichy, whilst overlooking his occasional poor positional sense, which is covered by sheer pace and energy. Silvestre is of the same mould, but at 31 is losing the asset that saved him throughout his career – speed. Can you see this man playing for Arsenal? There is a reason that Ferguson is happy to let him go to a great rival in City, and if the rumours are true and he is willing to sell to Arsenal, it is simply because he no longer rates the Frenchman. Wenger has often spoken about not signing older players to block the transition of the younger ones, and this seems a classic case. We did not know how good Clichy could be until Cole left. Traore is still raw, but with Gallas able to shift to the left, we are not short of options there. I see no point in this signing at all. Because, let’s face it, Silvestre would never care about Arsenal. He is a United man now, and is not the fighter that Gallas is, which would enable him to bring passion wherever his plays. So here’s hoping my first instinct is right, that this story is a load of utter garbage. All summer Arsenal fans clamour for another centre back. They buy one (centre back is his favoured position), and then the complaints come. Fine, Fergie doesn’t rate him any more – he’s got O’Shea and Neville as back up defenders. Wenger’s got Senderoos. Surely as a stop gap Silvestre’s not a bad thing? Well, it is a strange one. If he is a first choice centre back, then fine – the Toure and Gallas partnership isn’t exactly clicking. But is he good enough to be first choice? Ferguson doesn’t think so. And if he isn’t first choice, then where does this leave Senderos and Djourou, for whom this was supposed to be a big year?